From the early childhood research, it is evident that the learning environment for infants and toddlers plays a significant role in their development. At Fairchild Junior Academy we have worked closely with early childhood experts, architects, designers and university researchers to ensure that our learning space provides every opportunity for children to imagine, discover, take risks, be curious, construct, ask questions, and explore their senses. Our Playgroup occupies the entire 4,600 sq ft, top floor of the Park Commercial Centre. 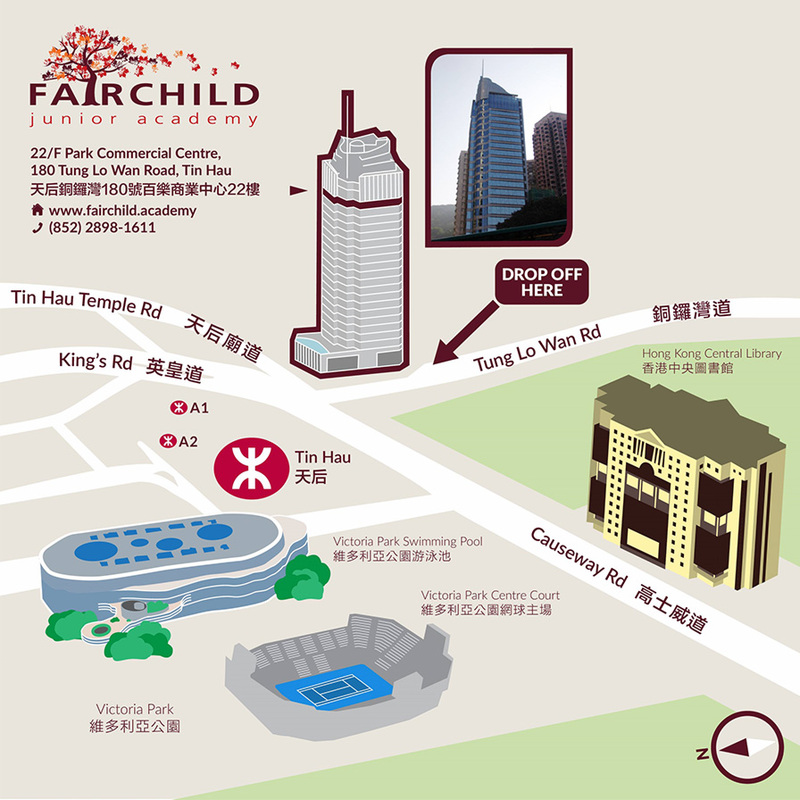 It has floor-to-ceiling two-story windows and a 180-degree view of Causeway Bay, Victoria Park and Harbour. 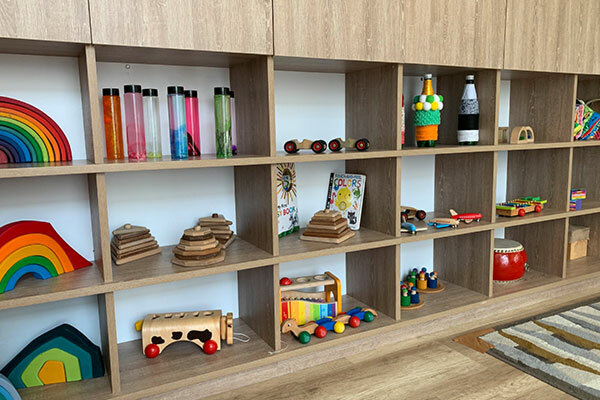 There is ample natural light in all four purpose-built classrooms to offer a warm and welcoming atmosphere, ideal for young children to play and learn. In an effort to bring the outdoors in, the centre includes a tree house, discovery loft, vertical garden and an aquarium\terrarium. These structures will assist teachers to make the environment come alive for students to learn by providing opportunities for hands-on experiences with natural elements which is an integral part of the curriculum. 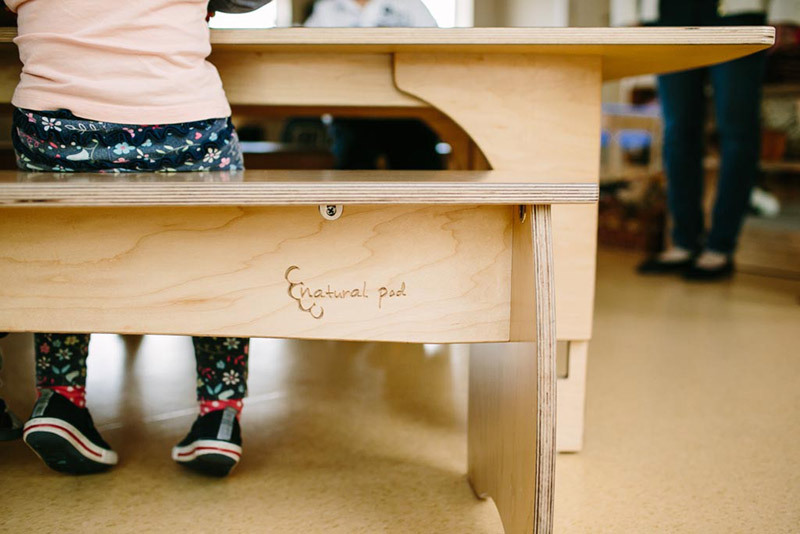 The Reggio Emilia inspired approach has reinforced our belief that the space within the school (the environment) be considered the ‘third teacher’. Teachers will intentionally organize, support and plan the various spaces for children’s exploration and discovery. 'If the environment is the third teacher what language does she speak?' is critical to our belief that the environment gives children important messages and cues. In other words, the environment ‘speaks’ to children - about what they can do, how and where they can do it and how they can work together. We have specific goals for children that support self-regulation (behaviour, emotion and attention), identity, social inclusion, health and well-being, language and thinking skills, physical skills, as well as the foundational knowledge and concepts needed for literacy and numeracy. Although teachers will utilize various international curricula, it is important to note that they will follow a process of inviting and sustaining learning. Once teachers have prepared an environment rich in materials and possibilities, they observe and listen to the children in order to know how to proceed with their work. Teachers use the understanding they gain thereby to act as a resource for them. They ask questions and thus discover the children’s ideas, hypotheses, and theories. They see learning not as a linear process but as a spiral progression and consider themselves to be partners in the process of learning. After observing children in action, they compare, discuss and interpret their observations with other teachers to leave a map of what has been observed. They use their interpretations and discussions to make choices that they share with the children. One of the highlights of our space is a 250-gallon freshwater aquarium\terrarium which greets you as soon as the lift opens on the twenty-second floor. 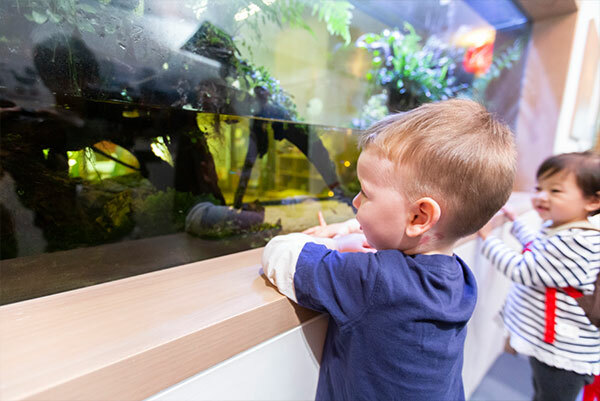 Children will have the opportunity to experience the life cycle of a variety of fish and plants, enhancing their connection to the natural environment. This will help them foster a sense of respect and care for nature. One of the challenges that families with young children face in Hong Kong is finding adequate outdoor space to explore, climb, swing, and slide. Children walk into FJA and are immediately drawn to the indoor tree house in the large reception area. It is a place to socialize, explore, exercise large motor muscles and have FUN! 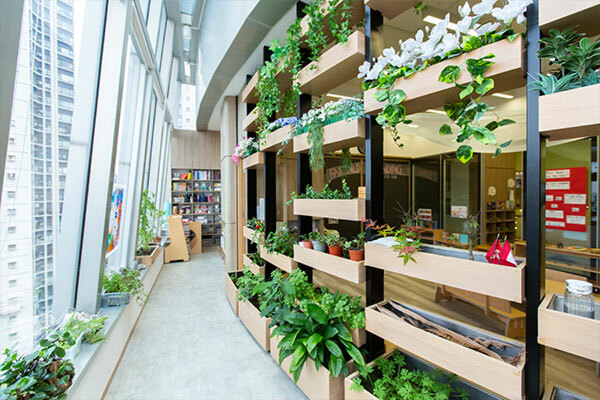 One of the walls at FJA is a vertical garden where the children will be able to get hands-on experience digging, planting, watering and taking care of various forms of plant life including vegetables, herbs, flowers and vines. We have established a partnership with professors from the Faculty of Land and Food Systems at the University of British Columbia in Canada to assist in the implementation of the vertical garden. FJA has partnered with Natural Pod, a Canadian owned and operated company which is passionate about natural play. 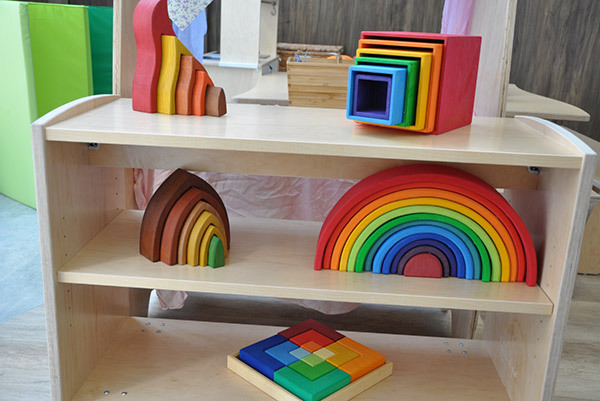 Natural Pod manufactures exclusively designed, environmentally sustainable wood products for play and educational environments for children. Every product Natural Pod designs and builds is a joint collaboration with educators, architects and designers. Products are natural, non-toxic and meet the highest environmental standards. 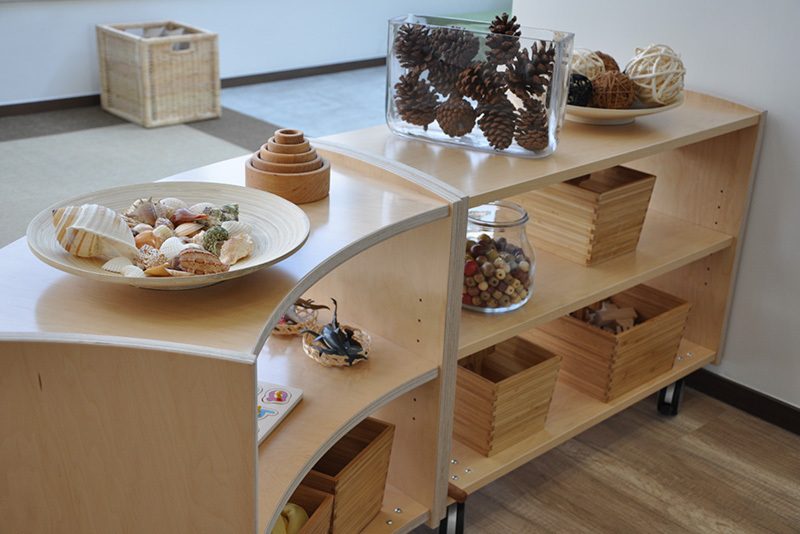 FJA is outfitted with Natural Pod products, emphasizing our commitment to children and their learning environment.